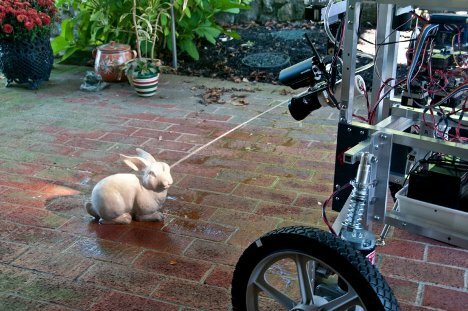 Gardeners who are tired of rascally rabbits and raccoons getting into their veggies can rest easy now that Steve Norris has invented the PatrolBot Mark II. 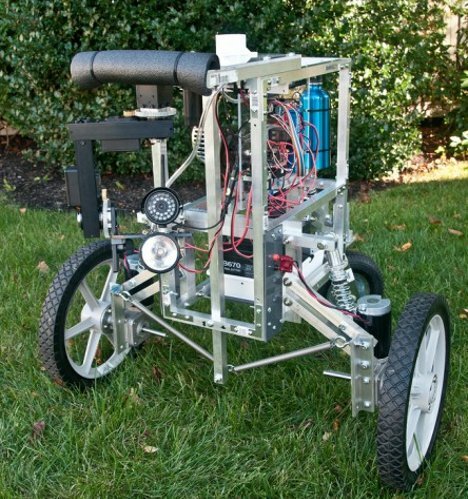 The all-metal telepresence robot is designed to be a lean, mean, varmint scaring machine. Armed with a super-bright flashlight, 100-db car horn and working water gun, the hefty robot is more than adequate for keeping your garden safe. Being a telepresence robot, the PatrolBot Mark II is controlled from the comfort of its creator’s living room. The robot beams a live video feed of everything it sees back to Norris so he can keep up on all of the news from the yard. If he sees an unwelcome visitor, he can beep the horn, shine the light or (our favorite) spray the water gun to scare it/him/her away. Although it was meant to be rugged and long-lasting, the PatrolBot Mark II wasn’t meant to be a serious home defense device. Still, it looks like the best way ever to keep an eye on the vindictive neighborhood paperboy or find out exactly whose dog has been leaving land mines in your front yard. See more in Do It Yourself or under Technology. November, 2012.